Repeat drunk drives could soon have a harder time starting their cars. 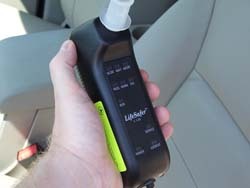 Proposed legislation at the Capitol would require repeat drunk drivers to have Ignition Interlock Devices installed in their vehicles, which prevent a car from starting if the driver has been drinking. The devices would also allow the devices to be ordered for first time offenders who are arrested with a BAC above 0.15. State Representative Tony Staskunas (D-West Allis) says the device would have to be in place for at least one year, and would have to be installed before a repeat offender can get the drivers license reinstated. Despite efforts to curb drunk driving in Wisconsin, cases continue to increase. Staskunas says New Mexico was facing the same problem, before adopting a similar requirement in 2004. Since it took effect, he says OWI recidivism is down 70-percent in the state and fatalities due to drunk driving are down 30-percent. Current state law does allow judges to order an IID for a repeat offender, but Staskunas says many avoid the penalty because there&apos;s no real oversight for their use. He says the bill being considered by a legislative committee would establish a program to monitor the devices and make sure offenders are complying. It would also require offenders to pay a fee to help cover the costs of the program. Staskunas say requiring the devices will help to rehabilitate repeat drunk drivers by helping them to separate drinking from driving. He says it also allows them to stay in their community, keep their jobs, and seek treatment.